I usually write my escapades into the world of OS X on my handy little MacBook, but for the first time in my history, I come to you with a story of heroism and grief, misery and glee. I give you my article on a real low-end Mac. Well now that the glorious tales of adventure are over, let's get on to the article. It all started a long time ago, in my church's music office far, far away. There I spotted an unused, unloved computer sitting on a shelf, feeling lonely. I took it upon myself to find out what this computer was and why it was so alone. It turned out to be the old music computer, a Mac IIsi. 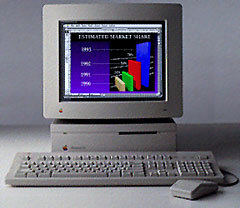 I did a little research about it on Low End Mac and found that it was an acceptable computer in its day. I snuck on up to the person in charge of letting me acquire the little Mac, and I was given the go ahead. I gleefully brought it home, Extended Keyboard II and all. I set it up as best I could (no monitor yet, it turns out that a VGA port is not the same as a DB-15 port) and spent 15 minutes looking for the power button - only to find that it had a burned out power supply. Longer story short, I headed down to my local RE-PC (the one I go to specializes in Macs, go figure) purchased two power supplies for $5 and a NuBus ethernet card for 98¢. I also got a free MultiScan 720 monitor as well as a VGA to DB-15 adapter from another store. I set up the system, upgraded to System 7.5.5, successfully got my SCSI Zip drive to work (don't get me started on that Zip drive, that's for another article altogether), upgraded by adding 16 MB of RAM, downloaded Word Perfect 3.5 (because I don't want to be stuck with Word 5), and began typing this. So how does a Mac OS X user adjust to life on the low end? It might surprise some people to hear this, but I prefer it over OS X for doing things like writing articles or essays for class. The reason is that I can get everything done many, many times faster then I ever could in OS X. Why? Because I have no distractions. It's just me, my Zip disk (which holds most of my software), and this keyboard. The only thing to get in my way would be Sim City 2000. Don't believe what you read about the IIsi here on LEM; it's quite a wonderful machine, even if it only runs at 20 MHz, and with 17 MB of RAM (and a rumored capacity of 65 MB) it will do whatever you need to do easily - apart from boot in a timely manner.